This composting toilet was built to provide volunteers at the community garden with a sanitary, low cost bathroom in a location with no sewer connection. 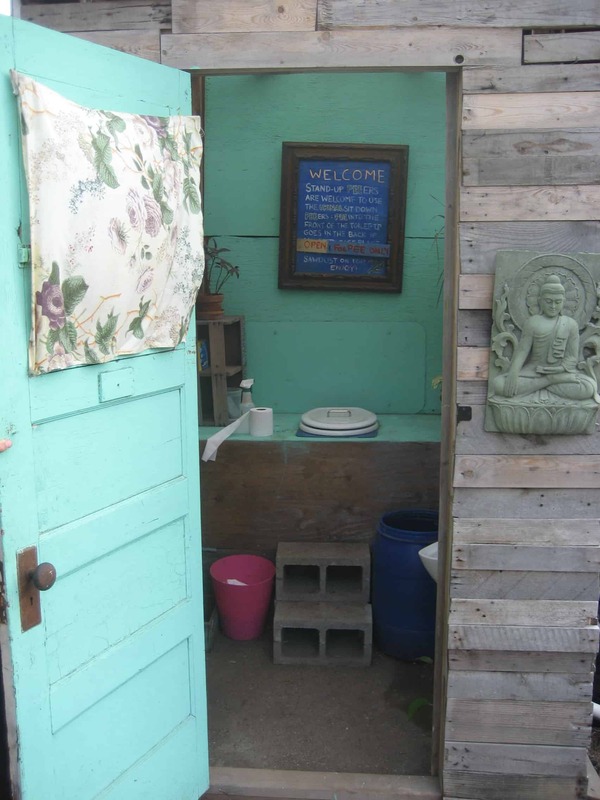 Goals: To have an ecological toilet on site at the garden. Prior to the composting toilet there was no bathroom facility. 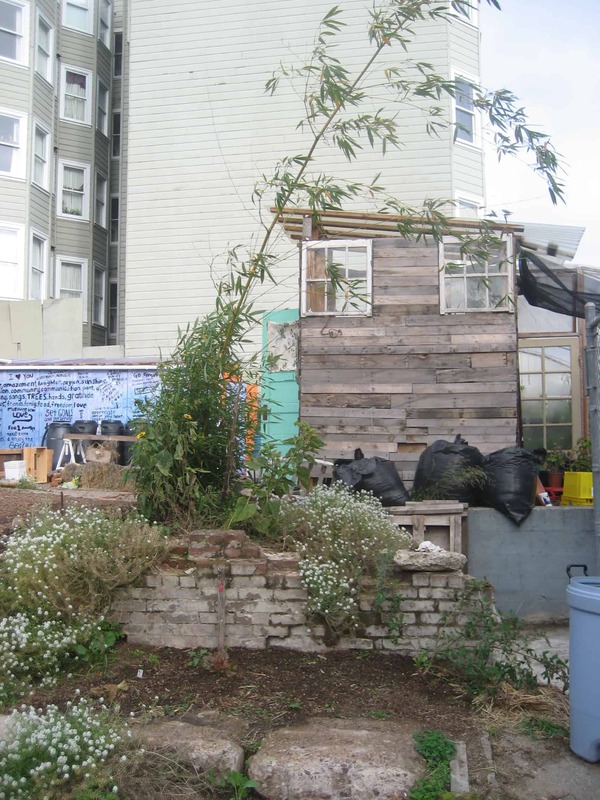 Site description: This is a community type garden located on private land in SF. 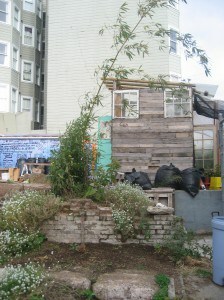 The composting toilet was built in June of 2010. 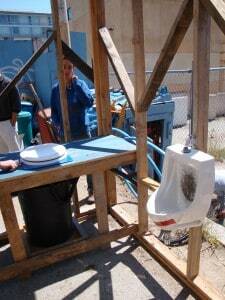 Cost: Urine diverting toilet seat- $120, wood, urinal, caulk, nets, poop containers, hardward, around $180. Total cost for toilet and structure: around $300, not including labor. This composting toilet has a urine diverting insert to separate the pee from the poo, and a urinal in the building. 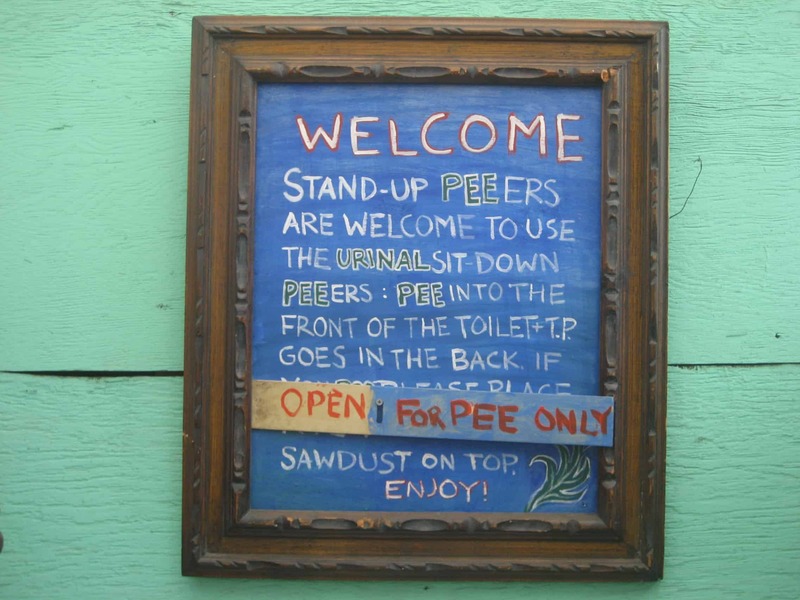 The urine from the diverter and the urinal drain through a 1″ pipe into a patch of bamboo down the hill from the outhouse. Clear signage in the bathroom describes how to use the toilet. Currently the bathroom is only being used for peeing, since there aren’t enough volunteers to change out the poop barrels when they fill. Anyone who needs to use the bathroom at the garden gets a little education about composting toilets. “On farm tours I always talk about and use it as a moment for talking about problems with the industrial water system. In general, most people seem enthusiastic about it but a few are shy about using it,” said a garden volunteer. 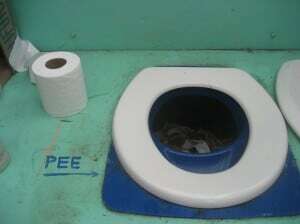 Sit down pee-ers use this urine diverting toilet seat. The urine flows to the bamboo patch. 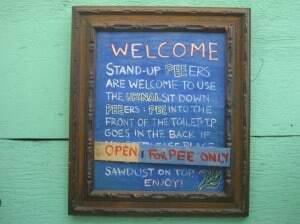 There is also a standing urinal. 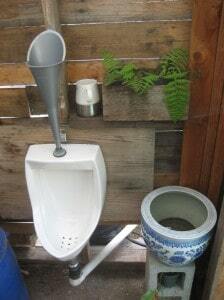 Men pee in the urinal and then pour a cup of water down the urinal (water is kept in a container next to the urinal) the pee and cup of water run down the pipe to a bamboo patch. The bamboo patch that is fed the urinals creates beauty and greenery. Bamboo is a hardy plant and tolerates the high nitrogen content of the urine, and the salts. Urine is distributed subsurface into wood chips around the bamboo. This is a construction photo showing the internal layout of the bathroom space as it was built. The stand up urinal can be seen on the right and the sit down model is in the back center of the structure. The structure was built high enough to allow 20 gallons poop barrels to be inserted below the toilet. A hatch in the back allows for easy access to switch out the containers. Specifications and Notes: The sit down and the stand up urinal both have separate plumbing that both feed to the same bamboo patch, this creates less maintenance. Maintenance and trouble shooting: The urinals do not require much maintenance at all because they both feed directly into the bamboo patch. The poo option is not currently used due lack of volunteers to coordinate the effort at this time.